Firefly Fun House Raiders, Continued Shake-Ups & more! Jay, Scott and Jake welcome guest panelist TK Trinidad into the studio and the quartet dive into Dustin Rhodes AEW news, WWE going back to Saudi Arabia, Sam Roberts getting cheap heat, Bray Wyatt's new children's show, Bayley's edge, who the hell has a Roku and much much more! Scott, Dale and Jake are talking all about the Superstar Shakeup! Who benefited the most? Who will it hurt? Who SHOULD’VE been shaken? What show won? Does any of it matter?! All that plus Sasha is upset, Luke Harper wants to follow buzzards away from WWE, Impact made some good decisions but also murdered someone, and you show your love to Jonny via the Compadres Hotline! Post-Wrestlemania-Mania! w/ Every Compadre in studio! Jonny, Jay, Scott, Dale and Jake are ALL in studio because Wrestlemania-Mania is running wild! It's been a crazy 5 days straight of exciting and newsworthy programming, NXT Takeover, The Hall of Fame, WRESTLEMANIA, and both Raw and Smackdown are all fresh on our minds with highs, lows, suprises, controversy and everything in-between. The quintet cover as much as they can in time, all culminating with a very important announcement from a very important Compadre. SD Women's Title Backlash, Kofi-Mania! Jay and Jake welcome Paul Bianchi, host of Mythunderstood and DM of Dungeons & Dragon Wagon into the studio and the trio dive into a newsworthy week of wrestling as Charlotte flair wins the Smackdown Women's Title in a shocking, last minute match just weeks before Wrestlemania mustering up a lot of backlash, mostly on behalf of Asuka. Also, Kofi-mania is on, Triple H's career is on the line, The Hart Foundation are future Hall of Famers, names are being cut in half like deals by a used car salesman and much much more! Jay and Jake are in studio with Dale on the line and the trio discuss this past weekend's WWE Fastlane PPV and it's unique feel - last minute changes, bizarre endings and at times stunted execution as well as all the fallout and new developments on Raw and Smackdown. All that plus the Dusty Rhodes classic starts, the Hall of Fame gets some Heat, JR is the "Voice of Wrestling," and train metaphors nearly DERAIL the show! WWE Fastlane Preview, Wrestlemania Speculations and more! Jonny, Scott, Jay and sometimes Jake are in studio talking all about this upcoming weekends Fastlane PPV event. After another eventful week that saw the crowning of a new US Champ, the reformation of the Shield, Triple H breaking 4th walls, Ronda Rousey imploding and the return of Mustafa Ali, the Road to Wrestlemania gets more interesting by the day and the quartet are dissecting all of it. Also King Kong Bundy, new WWE Hall of Famer, Impact Wrestling Contracts, Dana Warrior becomes a writer, and YOUR calls to the Compadres HOTLINE! Roman and Dave and Kevin, Oh My! It was an exciting and eventful week of WWE programming and Scott and Jake are in studio with Dale on the line to talk ALL about it! From an amazing and emotional announcement by Roman Reigns to a shocking return by the Animal Dave Batista on Raw to Vince McMahon replacing Kofi Kingston at Fastlane with Kevin Owens - there are definitely some thoughts to be shared. If that wasn't enough for your greedy Compadre ears they talk all about the recent firings and signings of various promotions, another WWE Hall of Fame announcement, take some calls on the Compadres HOTLINE, and even chat about what Sunny has been up to lately! Jonny, Jay and Jake are in studio on the heels of 3 consecutive nights of WWE events from the history making Elimination Chamber event in which Women Tag Champs we're crowned, a contender was squashed, a title was unsurprisingly dropped and Kofi Kingston solidified himself as the WWE Universes pick for the next WWE Champion - to a Raw and Smackdown that featured a storm of NXT Talent running rough-shot over the main roster 2 nights in a row! All that plus tons of news including DX, NJPW & NXT contracts being accepted and refused, as well as YOUR questions from the Compadres HOTLINE! Elimination Chamber Preview, AEW Signings and More! Jonny, Jay and Scott are in studio with Dale live via satellite, and the quartet dive deep into a HUGE week of wrestling news including some huge AEW Signings, Sales, and announcements, a NJPW Title changing hands, some interesting returns to Impact Wrestling, and a Smackdown Showing for Kofi Kingston that has the wrestling world buzzing. Then the Road to Wrestlemania continues with this weekends historic Elimination Chamber event which boasts an exciting card featuring the crowning of the first WWE Women's Tag Team Champions. Stone Cold Becky Lynch, Best of Raw & SD, plus Mark E. Xtreme in studio! Jonny, Scott and Jake are in studio covering all the news of the week including AEW signings, Taker's Twitter, Rick Flair's birthday celebration and hurricane Shane Helms' new job, and Jonny getting stink- faced (#QuastoStinkFace), as well as discussing Becky Lynch's back-to-back opening segments on Raw & Smackdown, what Kurt Angle's future is, and where the heck Harper fits in to everything. All that PLUS Mark E. Xtreme from On Your Mark is live in-studio as he continues to wage war on All Elite Wrestling! Jonny, Scott, and Jake are in studio and the trio are still buzzing about everything that's happened in the past week in Phoenix! From an amazing NXT Takeover and Royal Rumble Event to surprises and must see moments on both Raw and Smackdown Live! 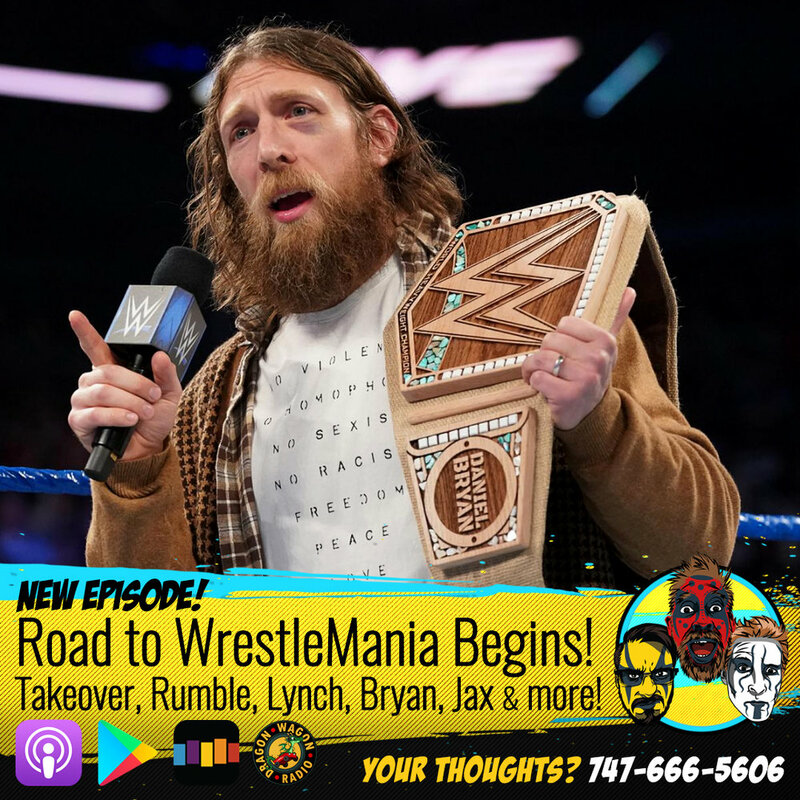 The Road to WrestleMania has begun with a jam packed episode that's as chaotic as the Rumble Match itself… and with just as much yelling! 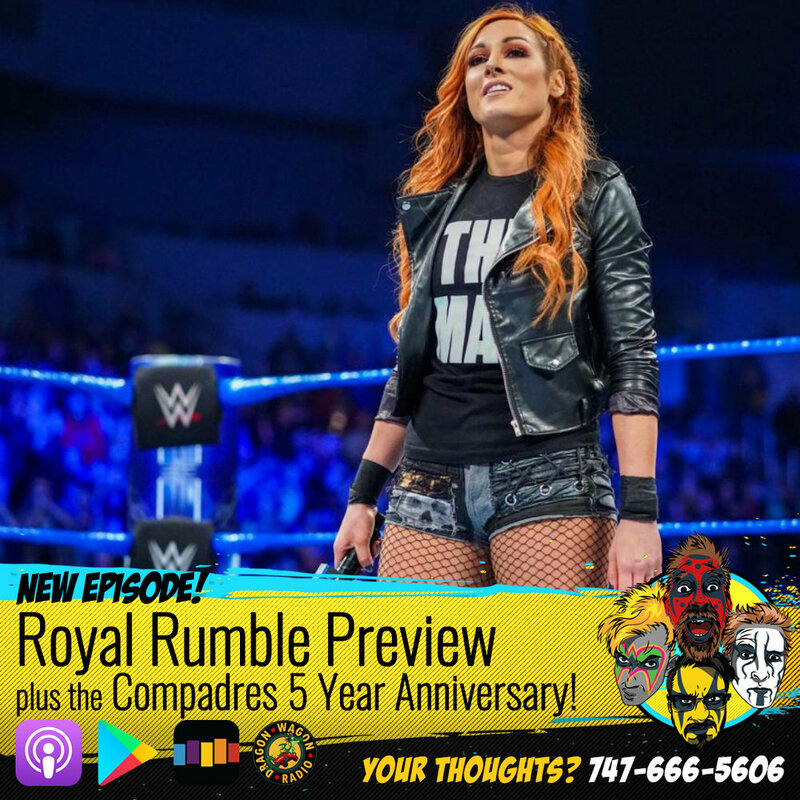 Royal Rumble Preview plus Compadre 5 Year Anniversary! Jonny, Scott, and Jake are in Studio with Dale on the line from Japan and the quartet are celebrating the 5 Year anniversary of Wrestling Compadres by taking a whole BUNCH of calls via the Compadres Hotline from the folks who made it all happen, YOU! But not before diving deep into this upcoming weekends WWE Royal Rumble event including wishes, speculations and expectations! Best & Worst of the Week plus NXT UK Takeover! Jay, Scott and Jake are in studio this week and the trio cover the best and worst in a full and generally pretty great week in pro-wrestling! From super from WWE Main Roster programming that saw a new IC Champ, a match of the year contender, and a major change to the Royal Rumble Universal Title Match, to the first ever NXT UK Takeover, Impact and ROH, the trio cover it all as well as take your calls from the Compadres HOTLINE! 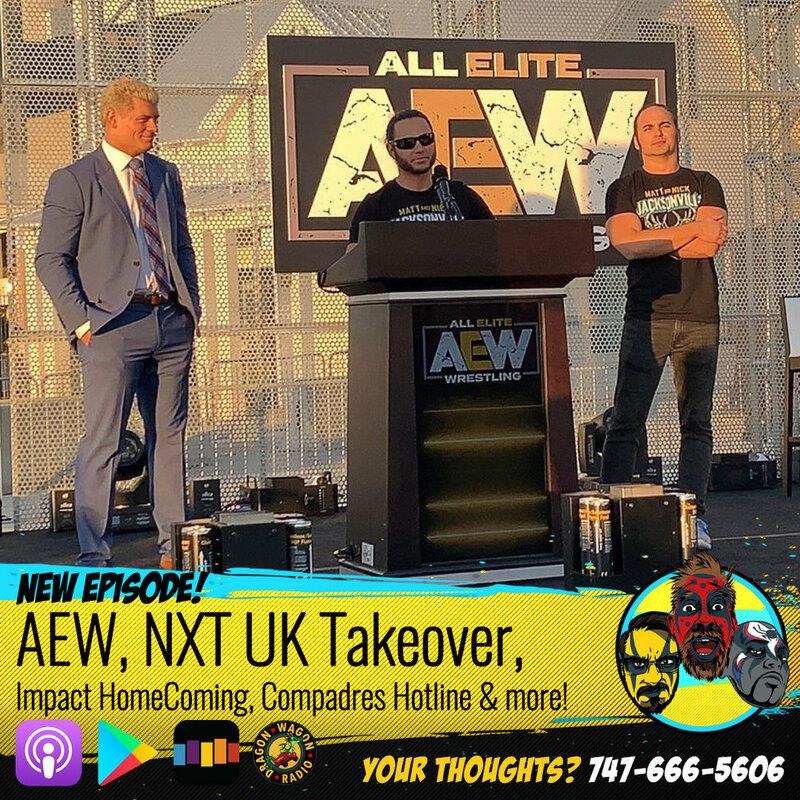 AEW, NXT UK Takeover, Impact Homecoming and More! Jay, Scott and Jake and in-studio for the first time in 2019 and there is a LOT to discuss! It's been a few weeks and there's plenty to catch up on in the WWE Universe as the road to Wrestlemania begins at the Royal Rumble... but there's a small group of folks who are interested in CHANGING the universe and today's trio is talking all about All Elite Wrestling's press conference/rally announcing Double or Nothing and who's already attached to their brand new promotion. Plus the first ever NXT UK Takeover is happening this weekend with every UK title on the line including the crowning of the inaugural UK Tag Champions. And if that's not enough, Impact Homecoming & your calls to the Compadres Hotline! The Ring Of Pakistan Special! As you've come to expect, your Compadres are global! This special episode comes all the way from Lahore, Pakistan as Jonny Loquasto was the host, commentator, and ring announcer at a historic television taping for the upstart promotion Ring of Pakistan. On his final day there, he sat down with the current ROP World Champion Baadshah Pehalwan Khan (@BaadshahPKhan) as they discussed how ROP came about, how Pakistani wrestling fans have reacted, and plans for the future! The NJPW Wrestle Kindgom 13 Special! Dale and Scott are coming at you from TOKYO JAPAN for a very special episode! Just moments after attending New Japan Pro Wrestling's Wrestle Kingdom 13 at the Tokyo Dome the two collect their thoughts and share their experience at the massive event. Scott and Jake are in studio to revisit some of the very best of Wrestling Compadres in 2018! From an altercation with Paul Heyman, interviews with Chavo Guerrero Jr, Baron Corbin, Marty the Moth, Kacy Catanzaro and THE MAN, Becky Lynch to clips never heard before in the podcast feed from our favorite Patreon Bonus Episodes! The duo reflect on not just the year in Wrestling Compadres but also on their personal favorite things from Wrestling as a whole in 2018!